OK- Big shock here….no recipe this time. A first for me. But I just had to share my “new toy”. 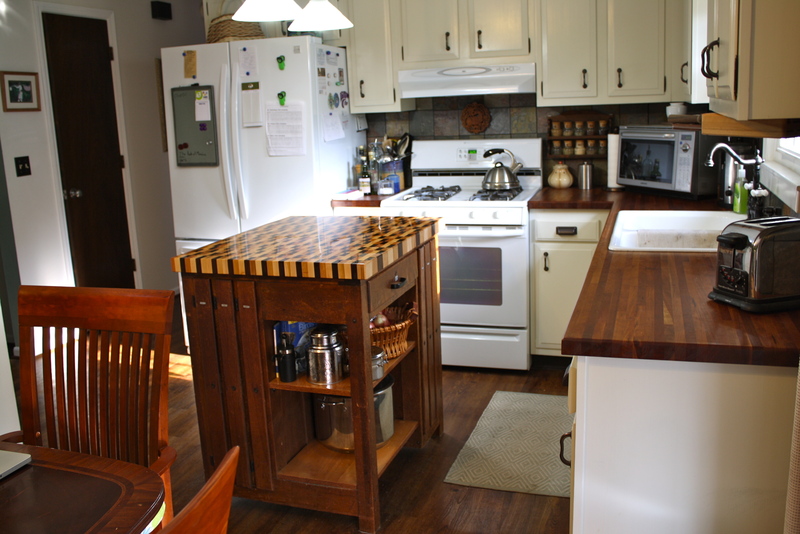 I had an end grain island top made for my kitchen! About 4 years ago, I started a remodel of the main floor of my house. Nothing too major. Refinished cabinets, put in cherry butcher block counter tops, new sink and faucet, dishwasher, garbage disposal and exhaust fan. 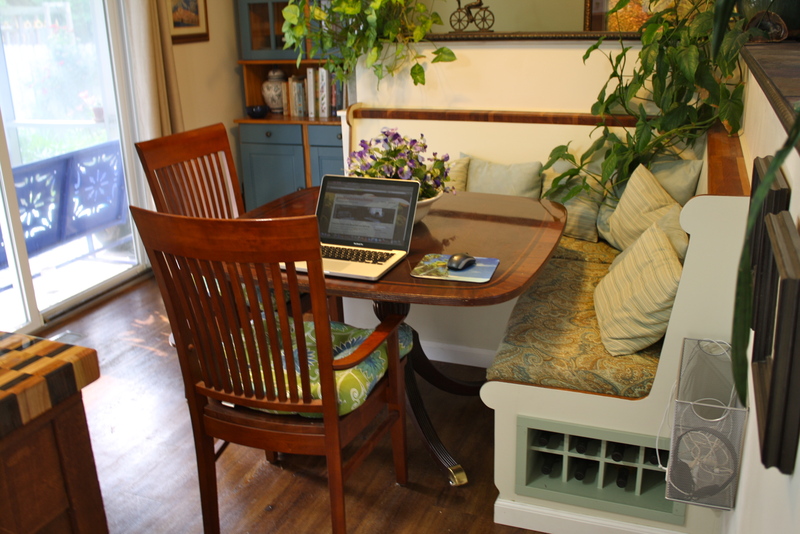 I also put in a new floor and swapped out a banister for pony walls (1/2 height wall) and put in a banquette. I did the work myself with my oldest son serving as my helper. I did hire an electrician to give me 2 pendant lights and a ceiling fan with light over the dining room table. I knew how to do it, had the time, but was short on money. It was a marriage made in the piggy bank. I did other work to the main floor as well…not relevant here, but the one thing I couldn’t afford was a top for my island. The island is an old architect’s desk that I revamped for kitchen use. 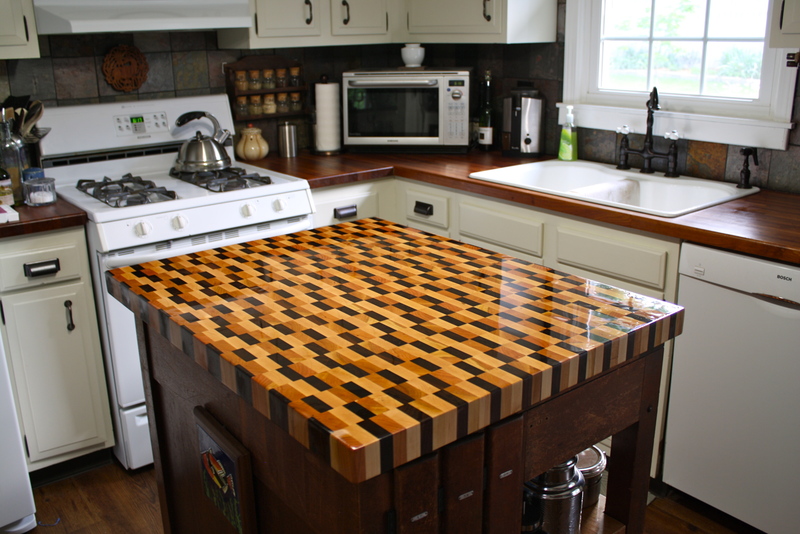 What I really wanted was an end grain top so everyone could cook together, but I settled for furniture grade plywood at the time. Now jump to the present. I have just finished up 2 1/2 grueling months of a new computer system build. Something I had never done. I learned a lot and now have new responsibilities, but that’s OK. It keeps my job interesting. AND….I made some extra money too. So I decided that I deserved getting something I have wanted for several years. That end grain top. I found a man in Pennsylvania to make it for a reasonable price and it came in this week. I often wonder what the kitchens of my fellow bloggers look like. Here are some shots of mine. Enjoy and remember….some things are worth waiting for. The banquette I built and latter added new wine rack in the end. Both benches open for storage. Placing it on a ponywall allowed for more floor space. View of the kitchen from in front of the blue hutch above. The architect’s desk has a new life. Two shelves in the knee space and a great new cutting block top. My new top, still on its drinking binge. Can’t wait to get started!